The fourth edition of REWIND-A-WAI is now available for all POST Wrestling Café patrons – go to Patreon.com/POSTwrestling to download OR check your podcast app if you have subscribed to the RSS feed provided to all members. 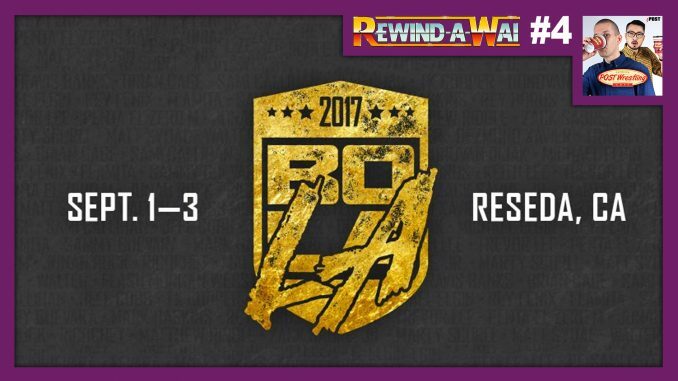 John Pollock and Wai Ting return for another edition of Rewind-A-Wai and are tackling the final stage of Pro Wrestling Guerilla’s Battle of Los Angeles tournament from 2017. This edition of the show is presented by our “Espresso Executive Producer” Tyler Crane, who will join us to discuss why he chose this specific event and will provide his live perspective from attending this show. The final night of the annual BOLA tournament features some of the best talents in the world performing under one roof in Reseda, California. This includes past winners Ricochet and Marty Scurll, a match rated ***** between Keith Lee and Donovan Dijak, a battle between The Chosen Bros. and much more.